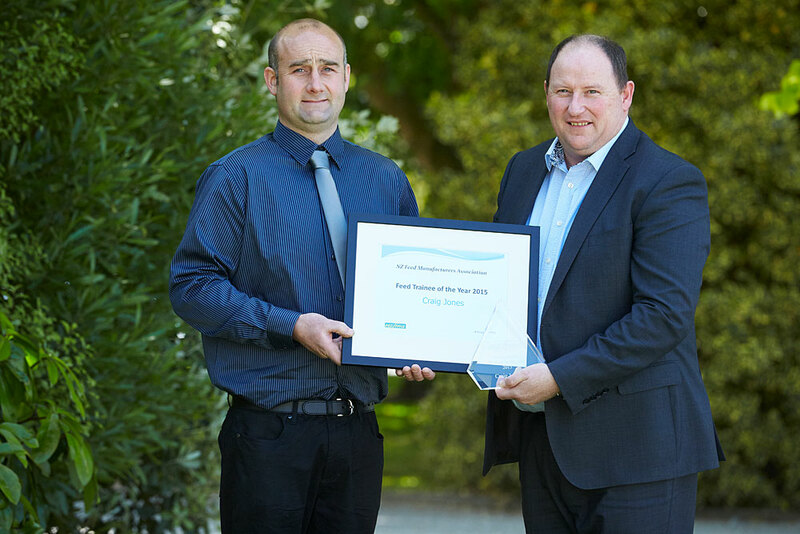 Born-and-bred Gore resident Craig Jones modestly says he has “a bit of experience” in the feed milling industry – and along with aptitude and enthusiasm it played a key role in his winning of the New Zealand Feed Manufacturers Association’s Feed Trainee of the Year Award for 2015. The prestigious award recognises the trainee achieving the highest overall marks in the Association’s industry training programme. Study for the 12-month course, which leads to the New Zealand Certificate of Stock Feed Manufacturing, involves a combination of theory units, workplace assessments and two two-day workshop courses. Craig is a Senior Mill Operator at the Sgt Dan Stockfoods Ltd pelletised feed mill at Gore, where he oversees a variety of computer-operated and manual processes from the unloading of pallets of ingredients when they arrive to dispatch of the finished product. Craig’s involvement in feed milling actually goes back to the age of 17, when a casual bagging job at an NRM mill in Mataura led to work in the feed press area and then further experience at a mill in Oamaru. During a year working for Solid Energy in Southland he gained a boiler ticket and undertook health and safety courses – which later helped him play an instrumental role in drafting the health and safety policies for the Sgt Dan mill in Gore. Craig says the year-long course gave him valuable new insights into the technical aspects of his role. As part of his award, Craig travelled to Christchurch last month for a presentation ceremony at the NZFMA’s Annual General Meeting, and attended a dinner with senior feed industry executives. Pic caption: Craig Jones, 2015 NZFMA Feed Trainee of the Year, (left), receives his award from NZFMA Chairman Philip Bracefield. The NZ Certificate of Stock Feed Manufacturing This certificated course is designed to equip feed mill operators (including blenders) with practical and theoretical skills in stock feed manufacturing. It is open to all Category A, B and Blender-approved NZFMA members. For further information visit the NZFMA website at www.nzfma.org.nz or email the NZFMA office at: info@nzfma.org.nz.